“Nougat is a term used to describe a variety of similar confectioneries made with sugar or honey, roasted nuts(almonds, walnuts, pistachios or hazelnuts are common, but not peanuts) and sometimes chopped candied fruit. The consistency of nougat can range from chewy to hard depending on its composition, and it is used in a variety of candy bars and chocolates. This recipe is good, but nougat has the consistency of the gummy candy. I was looking for something different, more crunchy, I guess. If you have some good recipes for the perfect nougat please, please, please let me know, my family loves them. This recipe also calls for edible rice paper, also known as wafer paper. The rice paper helps prevent the nougat from sticking to everything and makes it easier to cut, serve, and store the candy. It can often be found in Asian food markets and in some gourmet stores or purchased online. I did not have it, so I did it without it, next time I am going to use it. If you cannot find any, line your pan with parchment paper or foil and spray it thoroughly with nonstick cooking spray. I did. Place the sugar, corn syrup, honey and water in a large heavy saucepan over medium heat. Stir constantly until the sugar dissolves, then use a wet pastry brush to wipe down the sides of the saucepan to prevent sugar crystals from forming. Insert a candy thermometer and continue to cook the syrup, without stirring, until the candy thermometer reads 252 degrees. When the sugar syrup is nearing the proper temperature, begin to beat the egg whites until they are opaque with firm, stiff peaks. Once the sugar syrup is at 252, carefully remove 1/4 cup of syrup and keep the rest of the syrup on the heat. With the mixer running, slowly pour the hot 1/4 cup of syrup in a thin, steady stream into the egg whites. Beat the whites at high speed for few minutes until they hold firm peaks. While the egg whites are being beaten, continue to cook the rest of the sugar syrup until the thermometer reads 315 degrees. Once the syrup reaches 315 degrees, remove the pan from the heat. With the mixer running, pour the hot syrup slowly into the egg whites. Beat the whites on high until they hold the mixture is glossy and a thick ribbon forms when the whisk is lifted from the bowl. Stop the mixer and add the vanilla extract, pink food coloring, rose water, salt, and butter. 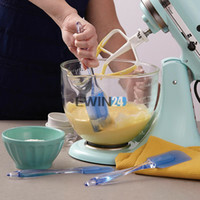 Turn the mixer back on until a thick ribbon forms when the whisk is lifted from the bowl. Remove the bowl from the mixer and stir in the nuts by hand. Prepare your pan by spraying it with nonstick cooking spray and lining the bottom with rice paper. If you don't have rice paper, line the pan with parchment paper or foil and spray it thoroughly with nonstick cooking spray. Scrape the nougat into the prepared pan. It will be stiff! Use a rubber spatula to scrape the candy from the sides of the bowl. Spray your hands with nonstick cooking spray and press the candy into a thin, even layer. Allow the nougat to set overnight. When you are ready to cut the nougat, spray a knife with nonstick cooking spray and run it along the edges of the pan to loosen the candy. Turn the nougat out onto a cutting board. Using a knife sprayed with nonstick cooking spray cut the nougat into small squares or rectangles. Your nougat is now ready to eat! If you will not be serving it immediately, it is a good idea to wrap the pieces in waxed paper so that they do not spread and stick together. Store the nougat in an airtight container at room temperature for up to a week. Wow! What a lovely post! They looks so gorgeous and so lovely!!! Stunning! Absolutely beautiful nougats! Would love to try this recipe! How nice do these look. my wife would go mad for this , she loves nougats.They look devine. lovely photo. Oh these look beautiful!! I love nougat! I wonder if it's possible to make without corn syrup? Do you happen to know if something else would substitute for it? I'm from Portugal and around here the most common nougat, the one you can find in every store, is actually peanuts. Definitely get the rice paper, it's edible. To make these treats you need to have a candy thermometer. Syrup should be correct temperature or it is going to be too runny.